They find a strong White male bias overall. The strongest finding is that 95% of the US book authors were non-Latino Whites and 96% of the US reviewers were non-Latino Whites (compared to 65% of the US population). There was a slant for non-US authors, too: “Of the 12 non-U.S. authors in the Times (10 percent of the total), 10 were white British, one was Israeli and one—Tariq Ali—was Pakistani-British.” Women were also barely represented: 13% of book authors and 12% of reviewers. Only two women of color made the pages of the NYTBR, both as authors; zero women of color were reviewers. After Words was also slanted, but much less so. 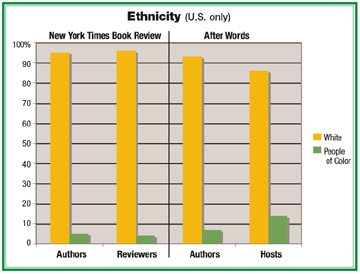 Of the handful of non-White people in the NYTBR, the large majority were writing on “ethnic” topics. In an interview about this study on NPR , Christopher Lehmann-Haupt, a former editor of The New York Times Book Review through 2006 (and so not necessarily responsible for these numbers) seems to gabble around the issue, as far as I can tell, suggesting that the numbers are shocking but can’t possibly be due to any kind of pro-White bias at the NYT. First he says: “But that’s always the aim is to find the most interesting books. They get, what, 50,000 books a year. They go through them. They are always conscious of the fact they were newspapers, so they respond to what seems politically important, what seems to be of interest to their readers. And that’s how those choices are made. They’re never made are we representing, you know, (unintelligible).” And then, when pressed, seems to blame the major publishing houses for not publishing books by people of color. “Well, I think that, again, you have to go a little bit deeper. Publishing has become is going through a real crisis now. The most obvious thing is that the so-called midlist book, the book that isn’t going to be a bestseller, isn’t being published to the degree that it was, say, in the 1960s, where there was a conscious effort to represent diverse views, races and so forth.I think it reflects what’s being published. Does the book review – I don’t know what’s being published by smaller presses that might be publishing Latino writers, for example, African-American writers. But the major houses are simply doing less diverse books in every respect because they are aiming for the bestseller list.” When pressed about the lack of reviewers of color, he talks about the women on staff. Edit: I couldn’t help it, I do this too much with crime and imprisonment data, so I calculated estimated disparity ratios from the given data. Relative to population, Whites are about 9 times more likely to appear in the NYTBR as authors of “politically themed books” than non-Whites. Among Whites, relative to population men are 6 times more likely to appear as authors than women. Among non-Whites, men are 2 times more likely to appear than women. Among men, the White/minority disparity is 11, among women the White/minority disparity is 4. For reviewers in the NYTBR, the White/minority disparity is 13. Among Whites, the gender disparity for reviewers is 6, among men the White/minority disparity for reviewers is 11. The disparity ratio calculations for minority women reviewers are undefined, i.e. infinite, due to a zero divide. Thanks to White Readers Meet Black Authors for the tip.